Most recipes are really easy to veganize and it is getting easier and easier with all the faux meats you can find these days. This recipe calls for 1 1/4 lb beef, but I’m sure you could also easily use seitan if you wanted to avoid soy. 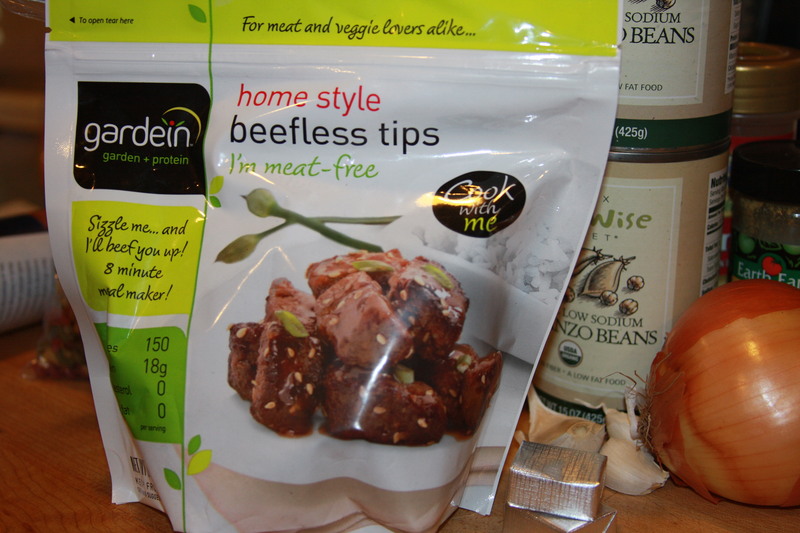 In this recipe (which I adapted from a recipe titled the same in the January 2012 O magazine), I used 2 packs of Gardein beef tips (9 oz each). I was really surprised at how fast this soup came together. I think maybe I may stir in some spinach next time. 1) Make your broth, if not using pre-made broth, and set aside. Heat 1 Tbsp oil in a large pot over med-high heat. 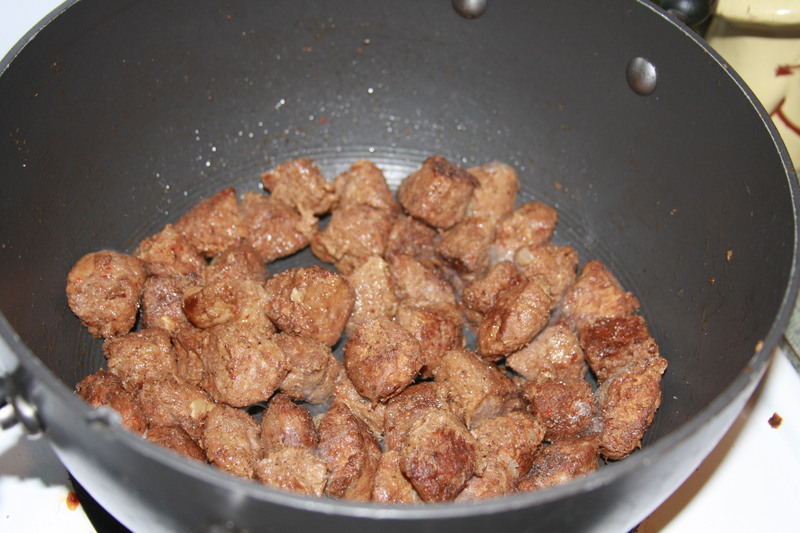 Add beef, 1 tsp salt and 1/4 tsp pepper. Cook, stirring occasionally until browned, about 10 minutes. 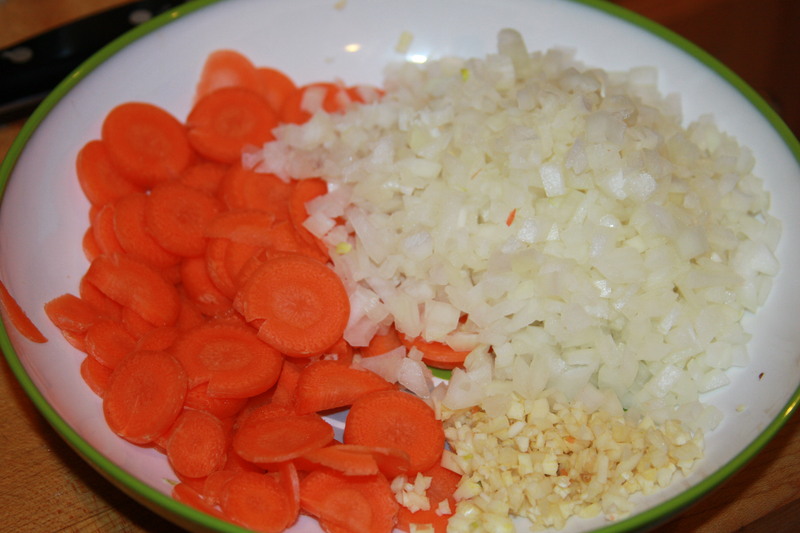 2) Add remaining 1 Tbsp oil, garlic, carrot, onion, and 1/2 tsp salt and cook until vegetables are softened, about 6-8 minutes. Stir in cumin, paprika, cinnamon, and ginger and cook, stirring constantly for about 1 minute. Add broth and bring to a boil. Reduce heat to medium-low and cover until beef is tender* (*the original recipe says to cook for 45 minutes so that the beef cooks, but I found with the faux beef that mine was good in less than half that time!) 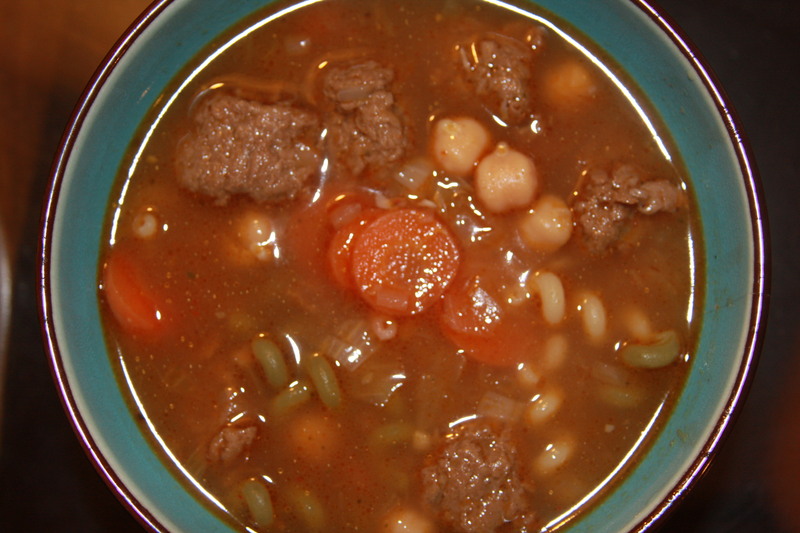 Go ahead and toss in those chickpeas now and let them get cooked with the soup to avoid them tasting raw. 3) Add the noodles, 1/2 tsp salt and 1/4 tsp pepper and continue to cook, covered until the noodles are al dente, 10-15 minutes. To serve, season to taste with salt and pepper, then ladle into bowls and garnish with cilantro (if using) and lemon wedges on the side. Serves 6. Can be frozen up to 8 weeks (though if you plan on freezing, I would recommend omitting the noodles until you are re-heating it). Those faux beef tips are tasty and freakishly beef like. 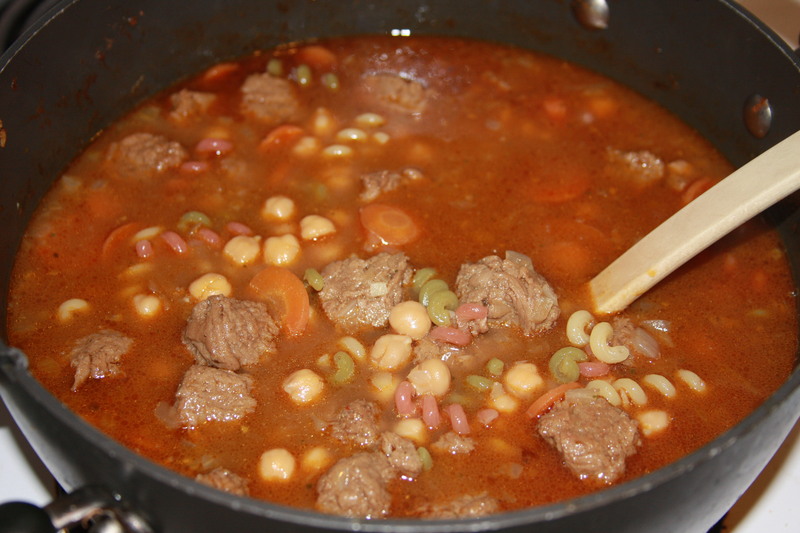 I thought this soup was very satisfying, though next time I use these faux beef tips, I’m gonna try a more traditional “beef” stew and dumplings recipe… one that would require a creamier sauce (rather than a broth) and a thicker stew with peas and potatoes. That being said, I really enjoyed this soup. 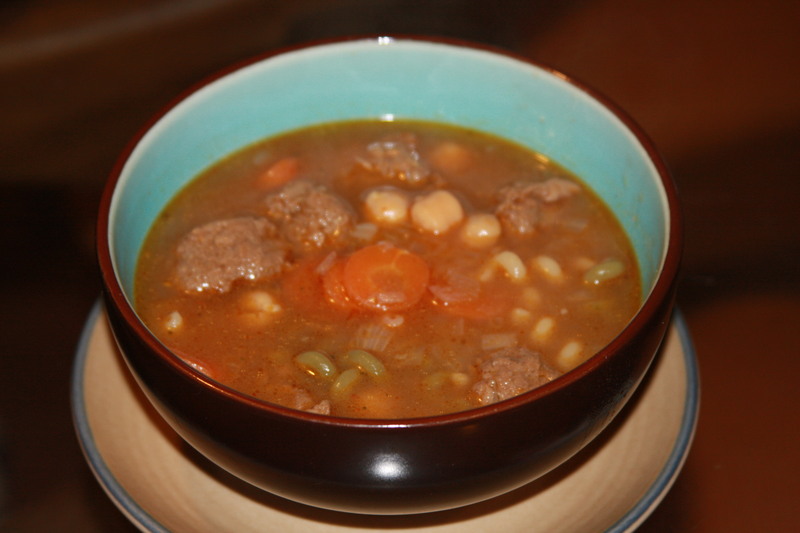 This entry was posted in fall, soup & stew, Vegan, vegetables, winter and tagged beef stew, garbanzo beans, moroccan beef stew, soup & stew, Vegan, vegetarian. Bookmark the permalink.